The Italian Interior Minister Matteo Salvini has published on social networks a threatening letter that has come to his address by allegedly some Albanians. 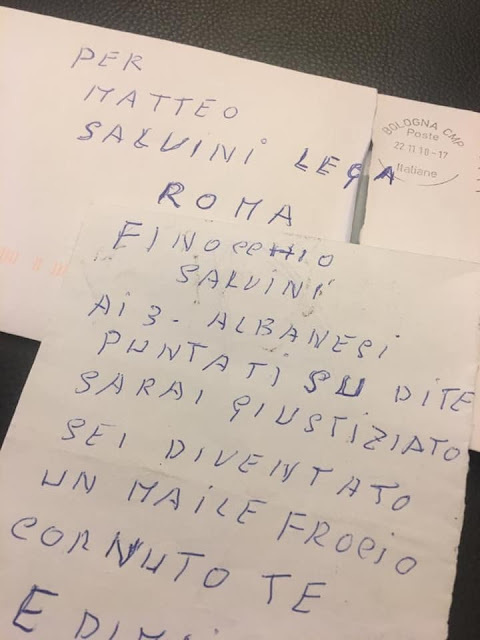 Salvini notes that this threatening letter came today in the ministry premises. Written with a bad grammar, the letter says among other things, "There are 3 Albanians behind you, you will be executed, you are pig, gay". Meanwhile, Salvin's comment on social networks was: "I walk forward in my work, kisses and hugs". In fact it is interesting to mention here that this letter is going unnoticed by world media, although Italy in fact is an important actor in the international arena in many senses. It is also worth mentioning the reaction of Matteo Salvini in the case when an Albanian was executed by Italian police after a robbery. In a Twitter response, he wrote that police officers deserve "a reward rather than a judicial process".